If you are interested in in buying agricultural products, you are in the right place. We export a variety of products from Nigeria to different parts of the world. 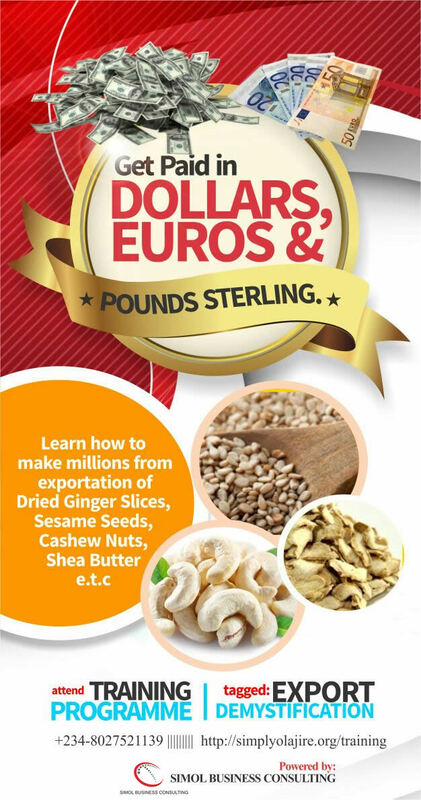 If you are an international buyer or consumer of products such as Tiger Nuts, Dates, Shea Butter, Shea Nuts, Turmeric, Cassia Tora, Sesame Seeds, Raw Cashew Nuts, Dried and Fresh Ginger, or Garlic amongst others, we welcome you to explore our page and place your orders for high quality products at very competitive prices. If you are interested in buying banana, plantain, pineapple or oil palm, please contact us. We have concluded plans to have our plantations shortly. Our interest is in helping businesses grow. We are particularly interested in start-ups and SMEs and are prepared to help them carefully and successfully navigate the many challenges that face new and small businesses. We also organize seminars, including export seminars, with the aim of helping people become entrepreneurs and, more importantly, successful ones. If you are in need of the guide that will ensure your business survive and become profitable, our doors are open to help you achieve that, and much more.